“I declare to you that I love another. He’s the reason I want to wake up in the morning, embrace the day. If your sword wound him and his face was unrecognizable to me, I will love him. If his tongue was cut from his throat, and I hadn’t his voice to delight me, I would love him. And if you make only a memory of him, I would love him even more eternally. That’s what you have to look forward to”. 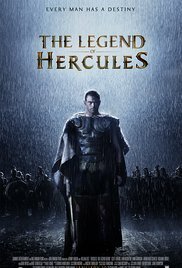 “The Legend of Hercules” has nothing to do with the legend of Hercules (or Herakles as the Greeks call him) as we know it from Greek mythology. I remember that I went to the local library as a little boy and returned home with a enormous picture book about the 12 labors of Hercules. This picture book was so huge, when I was reading it, nobody could see me anymore. And in this picture book I read about Hercules slaying a lion of Nemea and the nine-headed serpent Hydra, catching a Erymanthian boar, cleaning the stables of Augeas by means of a river, retrieving the flesh-eating horses of Diomedes and abducting the hellhound Cerberus from the underworld. In those days these heroic feats appealed to me. And they still do. But you won’t notice much of that in this Greek tragedy (in other words it’s a sad affair). Ultimately it’s just a pathetic hodgepodge of themes from various movies. A little bit of “Pompeii” which was also about a forbidden love between a princess and a slave who was forced to be a gladiator in Pompeii. The fight scenes were a weak duplicate of “300: Rise of an Empire” and “300” itself. Especially because of the use of slow motion effects. A comparison with “Gladiator” is also easily made. And then the end is a lot like a children’s matinee on Saturday afternoon with cartoons of mythological superheroes such as “He-Man : Masters of the Universe” which are shown on TV indefinitely. This movie is bland, uninspired and surely not legendary. The only impressive item in this movie was the chest of Kellan Lutz, who played Hercules. Perhaps it can impress teenage girls who marvel while looking at these muscular males. I was less impressed than looking at a crispy fried tiny chicken on my plate during lunch. In 1200 BC King Amphitryon invades the kingdom of Argos. It comes to a fight between him and his rival King Galenus. After defeating Galenus the kingdom Argos becomes part of Amphitryon his empire. He tells his wife Alcmene that this victory was for her. However, Alcmene is outraged by the thirst for power that her husband displays. That night she asks Hera, wife of Zeus, for help. Hera finally appears and predicts that she will give birth to Hercules, son of Zeus. Zeus (His father calls him Alcides) is born and after 20 years he has grown into a handsome muscular young man who is in love with the lovely Hebe. They hear the news that Hebe will be engaged to Iphicles, the older brother of Hercules. The two lovebirds try to flee. However, they are caught and Hercules is sent by his father on a expedition to Egypt, hoping he won’t return alive. Ultimately it appears to be a trap and the regiment is being ambushed. Hercules and the faithful Sotiris are the only two who remain. They are sold as slaves to fight as gladiators. Hercules is doing everything now to return to Tires to stop his older brother and his beloved Hebe to get married. In terms of originality, this story won’t win a price quickly. The SE’s used aren’t that impressive either. The fight with a lion in the beginning of the movie looks promising for a few seconds, but the animated lion has the same appearance as the computerized images of “Jumanji” in 1985. So, not really an improvement. The gladiator fights captivated me a bit. Yet it was a huge disappointment at the end. The fight that Hercules had to engage with 6 never defeated gladiators, was something I looked forward to. But it was just as if Zeus himself came along and interfered, because at that moment a storm came up here. And the first thunderbolt distracted me for a moment so I needed to rewind the whole thing because the great heroic fight was already finished. And I just want to mention for those who can’t endure blood : don’t worry, because there is not even a single drop of it in this film. I think they ran out of fake blood after filming “300: Rise of an Empire“. The moment Hercules and Hebe meet back at the lake, I got a deja vu feeling about those flying fluffy things. It was also something that annoyed me during “300: Rise of an Empire“. And the final battle with the lightning sword which smacked down hundreds of soldiers and the subsequent battle that Hercules fought with his father, was a bit exaggerated. It seemed like a Jean-Claude Vandamme scenario, where the hero first gets beaten up terribly before he claims victory. The performances are also fairly limited and meaningless. Kellan Lutz looks frightfully muscled and Scott Adkins is a rather sad looking king instead of a fearsome ruler. Maybe it’s the overdose of sandals movies I saw lately, so I wasn’t impressed with this “Hercules” remake. The only wow feeling I got was during the opening scene where the camera pops out of the water, swings over a battlefield with oncoming soldiers and then sways between the defending archers. A brilliant moment. But this level was not maintained throughout the film. The rest is an accumulation of stale and insipid situations. Hopefully “Hercules” with Dwayne Johnson, which comes out in the course of this year, will be far better. Extraordinary Blog! Keep it up!